STOCKTON, CA -Sometimes, in a winner-take-all playoff game, it's the stars of teams that surface as the heroes. Sometimes, the less heralded players rise to the occasion. For the Visalia Rawhide, heroes came from across the roster in a 3-0 shutout victory to secure Visalia's third California League North Division Championship in the last five seasons. Matt Milbrun, who had started the series opener for Stockton, took the ball on short rest with the intention of starting the game strong. He quickly fell into trouble with singles by Camden Duzenack and Drew Ellis. 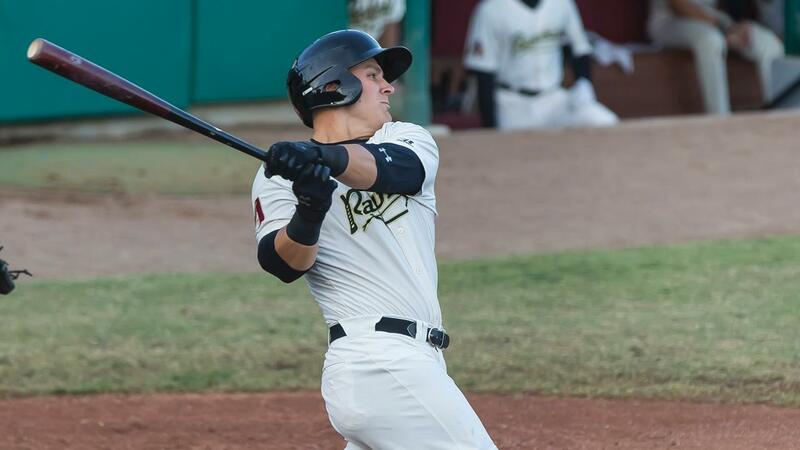 With one out, Daulton Varsho, a consensus top-ten prospect in the Arizona Diamondbacks system, got the Rawhide on the board with a three-run homer to right field. From there, the stars of the game rose from the pitcher's mound. Sebastian Kessay, who was signed by the D-backs out of independent baseball and who hadn't made an appearance singe August 12, was tabbed as the starter. Hoping to get through at least a couple of innings before turning it over to the bullpen, the southpaw pitched one of the best games of his career. He tossed four and a third no-hit innings, walking two and striking out five. He plunked a hitter with one out in the frame and was lifted before he could complete the requisite five innings to earn a win. But for a pitcher who was outside of the affiliated minor league system just six weeks ago and owned a 13.50 ERA coming into this start, he could have well deserved it. From the fifth inning on, the bullpen picked up where Kessay left off. Breckin Williams allowed a seeing-eye single to Brallan Perez to break up the no-hitter, and from there he dominated. Williams (W, 1-0) struck out four hitters over 1.2 innings. West Tunnell was perfect through in the seventh and the eighth innings to bridge the gap to Matt Brill in the ninth. Visalia (3-2) had been unable to put together any more offense over the rest of the game, though they had additional chances. Duzenack and Ellis put runners on the corners with one out in the third, Renae Martinez doubled to lead off the seventh, and Ramon Hernandez singled in the eighth, but the Ports bullpen held strong with seven four-hit shutout innings to set the stage for the bottom of the ninth. Brill (SV, 2) allowed a one-out single to Luke Persico, bringing up Viosergy Rosa. The last time they'd faced each other, Rosa hit a solo home run. Tonight, Rosa hit a weak grounder to short and Jasrado Chisholm nabbed Rosa at first on a running play. The next hitter, Edwin Diaz, hit a nearly identical dribbler up the middle. Chisholm made an identical play and threw out Diaz. And for the third time in five years, the Rawhide were crowned North Division Champions. The win was Visalia's first victory in a decisive game five since 2006 and just the fourth in franchise history. Duzenack and Ellis both put up a pair of hits to lead the Rawhide offense. Varsho's three-run homer provided the game's only runs driven in. One night removed from scoring 11 runs on 14 hits, Stockton (2-3) mustered just two hits in the shutout. Visalia next plays the South Division Champion Rancho Cucamonga Quakes in the California League Championship Series, starting on September 11. Visalia will host games one and two on the 11th and 12th before traveling to Rancho Cucamonga to finish the series. First pitch for all home playoff games will be at 7 PM. Tickets will be available starting on September 10 at 10 AM on www.rawhidebaseball.com.